1939 New York Safety Sticker - $20.00 : Bob Hoyts Classic Inspection Stickers, Add a Final Touch to your Restoration! This 1939 New York sticker was reported to be used used for roadside spot checks and by car dealers to cooperate with the cause of safety. It has the official logo of the 1939 Worlds Fair superimposed on the front . The back states that the car has been safety checked and has room for the owners name. 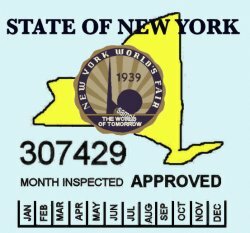 This sticker was the sticker that prompted NY to begin official statewide inspections later.